Sciatica | Dora Jackson, R.M.T. 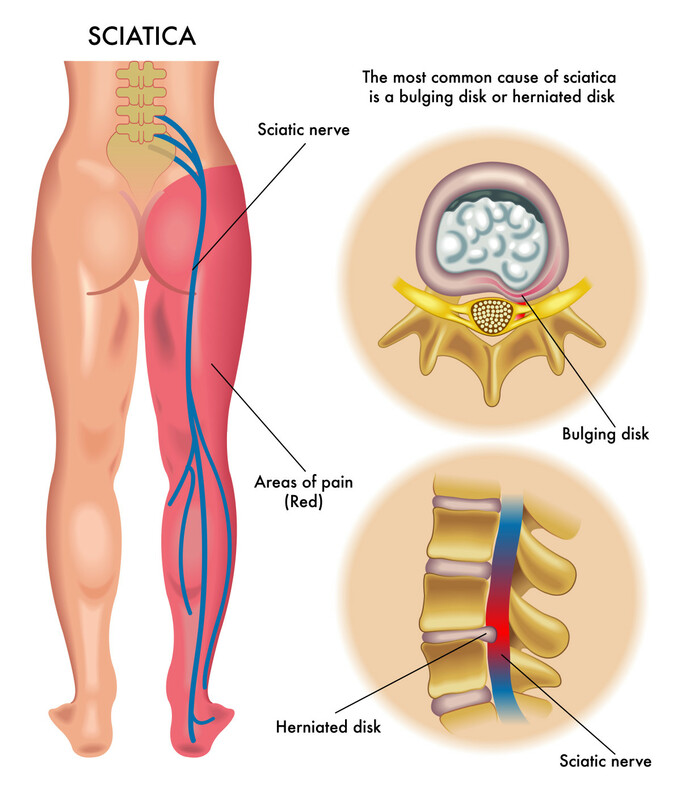 Sciatica is a catch-all term used by many health care professionals to describe a number of conditions. The sciatic nerve is a large nerve that begins at the base of the spine, passes through the buttocks and continues down the back of the thigh and into the lower leg. This nerve can become compressed or inflamed. If this occurs, pain may be felt along the length of the nerve down the back of the leg. This pain is referred to as “sciatica”. Core muscle strengthening. Many sciatica exercises focus on strengthening the abdominal and back muscles in order to provide more support for the back. When patients engage in a regular program of gentle strengthening and stretching exercises, they can recover more quickly from a flare up of sciatica and are less likely to experience future episodes of pain. Hamstring stretching. The hamstrings are muscles located in the back of the thigh. Overly tight hamstrings increase the stress on the low back and often aggravate or even cause some of the conditions that result in sciatica. Proper form. Doing the right exercises but doing them without proper form can make the exercises relatively ineffective and may even lead to continued or increased pain. It is generally advisable to learn the exercises under the guidance of an appropriately trained health practitioner, such as a massage therapist, chiropractor or physiotherapist. Adjustment of daily habits. In addition to an exercise routine, patients with sciatica should minimize everyday stress on the lower back, including using appropriate ergonomics while lifting, maintaining good posture, making sure the lower back is supported while sitting, and avoiding sitting or standing for long periods of time. Before beginning any exercise program, it’s essential to see a health professional to get a correct diagnosis and to rule out any more serious problems. The specific exercises will differ based on the condition that is causing the sciatic pain, so never try to self-treat before consulting a health professional.